ADVANCED Codecs for Windows XP - a set of components for playing multimedia and containers mkv, vob lossless quality. This kit provides an automatic update of existing operating system codecs, deletes obsolete items and includes a number of plug-ins to display streaming video directly in a web browser. The application allows you to set the priority in using the codec for a particular media file format. The utility is able to provide correct playback of FullHD video on less productive computers and organize automatic synchronization with the OS media center. 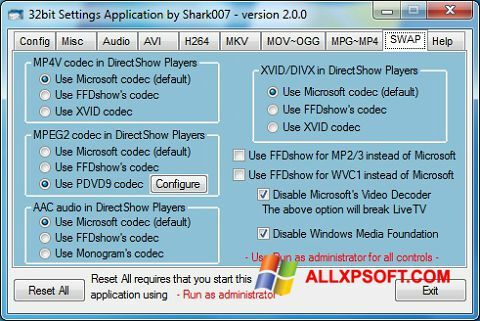 You can free download ADVANCED Codecs official latest version for Windows XP in English.